Today I will be on Relevant Radio discussing Bethlehem and the Birth of Our Lord Jesus. I wrote this article which I thought you might enjoy and find informative. 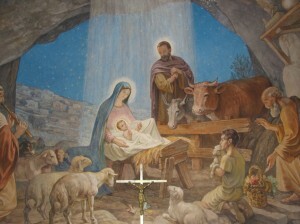 By the way, the picture below was taken from a mural painted in the Chapel of Angels in Shepherd’s Field in Bethlehem where the shepherds were actually tending their flocks by night 2,000 years ago. We take our pilgrims into the caves where the shepherds were staying. To join us on a pilgrimage to the Holy Land, with Steve Ray as your guide, visit www.SteveGoes.com.